Home > Health Care, Food, Beer, Retail, Tobacco > Retail Stores and Products A - S > Grocery Store Products, Inc. 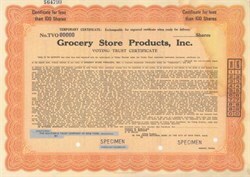 Beautifully engraved SPECIMEN certificate from the Grocery Store Products, Inc. This historic document was printed by the American Banknote Company and has an ornate border around it. Light water stain upper right corner.